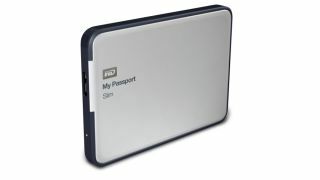 External hard disk drives (HDDs) have gone on a diet in recent years, and Western Digital's My Passport Slim looks to be one of the, er, slimmest yet. The company's new 2TB and 1TB models feature a metal-casing design. The former measures 4.33 x 3.14 by 0.7 inches wide, while the smaller of the two capacities is thinner at 4.33 x 3.14 x 0.48 inches. Both are protected with 256-bit hardware-based encryption and include WD's SmartWare Pro data protection software that backs up data locally or to a Dropbox account in the cloud. They're also equipped with USB 3.0 connectivity to keep files transferring at a nippy rate. The 1TB version is available now at a recommended retail price of €129.99 (around £108), while the 2TB model will be priced at €209.90 (around £177) when it lands sometime "next quarter". If you're looking for an external 1TB HDD and you're not bothered about it being a chunky customer, we spotted one for a bargain £59.99 a few weeks back, and it hasn't budged from that price. To view that and other tasty offers, head on over to TechRadar's Deals of the Week. Fancy winning a G-Technology G-RAID hard drive worth £299? Click here to find out more.